RC Fishing Boats American Style! You’ve seen remote control boats, well we thought they were just for kids. Let me tell you, these boats have come a long way, they are better built, and more powerfull then ever, and go unbelievable distances. Well, beside’s being an affordable way to have fun at the lake, there’s a fun new twist, using a remote control boat for catching fish! With Summertime right around the corner I know I’ll be looking for the most productive ways to spend my recreational time outdoors, and of course looking for ways we can spend our time having the most fun. A Fish Fun Co. Remote Control Boat is a most exciting remote control boat that will put more fun into regular fishing, and is guaranteed to make your trip to the pond, or lake one you will not soon forget. The way is works is simple, if you can work a remote controller for a television set then you can go rc fishing! “Now, if I ever wanted to be the Master Angler and catch a trophy size fish here’s my chance”! The only problem is if I can get the remote control boat away from Junior! Go trolling 200-300 feet from shore. 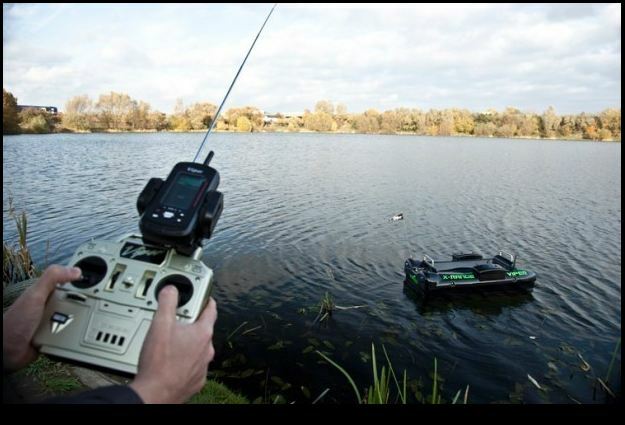 Use the line release, or pull in the fish with that big powerfull rc boat! Now you can get your line where you normally couldn’t cast. Pick a remote control boat, like the huge 32 inch “Radio Ranger” boat, or “Bass Pro”, “MasterCaster” or the “Ed Hardy”. Freshwater fishing at a lake or pond, even fishing canals in saltwater you never know what you’ll catch! The “Radio Ranger” one is almost 3 feet long, (32″). “I always wanted to be able to get my line to the other side”. “I can also get my line where I normally couldn’t cast, under tree’s and stuff”! Fish Fun Co. "RC Fishing Pole"
Besides the RC Fishing Boats, Fish Fun Co. also brings you “The RC Fishing Pole” a handy accessory so you can turn any remote control boat into a remote control boat that you can catch fish with! When you buy a r/c boat don’t forget to ask for “The RC Fishing Pole”, it’s about 20 bucks. Additionally Fish Fun Co also offers several different rc boats ready for fishing fun, all for the same price of a remote control boat! “I just can’t figure out if it’s just for kids, because it looks like alot of fun too”! Did you know you know you can pull in a fish with a rc boat? A Fish Fun RC Fishing Boat also comes with a fishing line with a hook and bobber, it goes on the tip of “The RC Fishing Pole”. So, just put on a worm or your favorite thing you use to catch fish and drive the boat wherever you think the fish is. Then watch the bobber, when you’ve hooked a fish, drive the boat back with the fish on it…. Catch any size fish with a Fish Fun remote control boat! “The RC Fishing Pole” is designed for big fish too! It has it all figured out to catch any size fish. Use your regular fishing rod with the line release pad (included). So, instead of casting you drive your line out, watch the bobber. Bammo, when that Ole’ Big Bad Bass hits, the line releases from “The RC Fishing Pole” and you reel in the fish! While other people may have tried fishing with a rc boat and a big fish sunk the boat these ingenious line release pads work like nothing else you’ve ever seen, only a Fish Fun remote control boat let’s you catch fish so many different ways. “The RC Fishing Pole” was made for real fishing in mind! bobber, hook, fishing line, everything, "The RC Fishing Pole"
“The RC Fishing Pole”Your Fish Fun Boat has Big Twin 380 type Hobby grade motors with enough to push it through the water at unbelievable speeds up to 20 mph. A 7.2 volt 1800 mah battery for the boat is standard, with a ac home charger. You also get the Remote Controller, and depending on what model you’ll also get 8-AA batteries. You also get a handy stand for the boat for when your not using it. And 2 extra propellers in case one breaks. “The RC Fishing Pole” also comes with your boat, the holders are pre mounted so just snap in the RC Pole and your ready to go! You also get 15 sets of line release pads, and a 2 foot fishing line with a hook on the end and a 1-3/4 bobber… Your Fish Fun RC Fishing Boat is ready right out of the box, it’s fully assembled. Just charge the battery for 5-6 hours, and put the batteries in the remote controller. Worm on the hook and go…. For the price of a remote control boat. Fish Fun Boats are about $69.00 which includes the FedEx 4 business day delivery. You can also get “The RC Fishing Pole” by itself with all the fishing accessories for $19.95 + shipping Catch fish all day long. The good thing about your RC Fishing Boat is you can get extra batteries at any hobby shop, you can even upgrade the battery to one with 5-6 times the power. A 7.2 volt 1800 mah battery comes standard, but you can get one up to about 7000 mah. Another good idea is if you decide to invest in extra batteries is looking into a Pro Charger….for about $39.00 you can charge your batteries in about 1/2 hour, and some of them come with a car adaptor, they will also monitor your batteries for peak performance. RC Fishing World also carries extra batteries. Where do I get a remote control fishing boat?